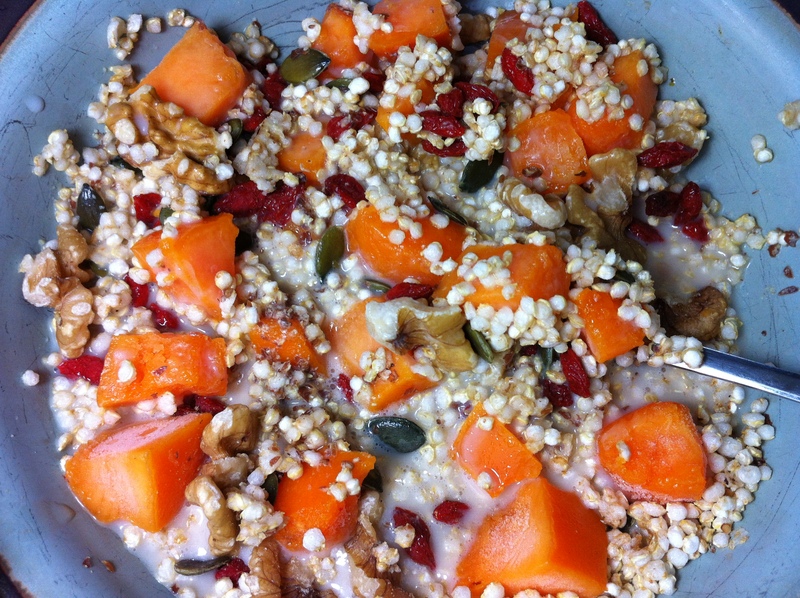 Puffed quinoa is my new breakfast buddy! It’s technically a seed, which satisfies my paleo wannabe side and makes a great gluten free cereal base. 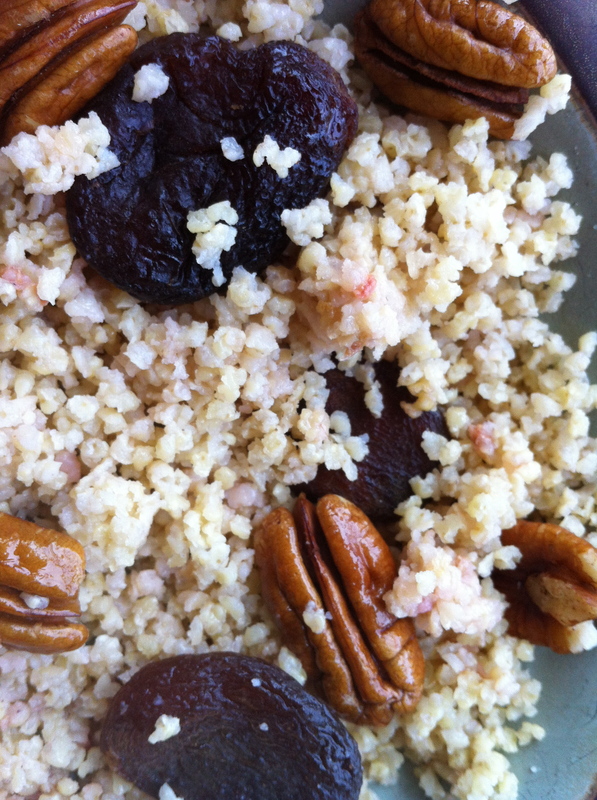 Here is a brand new recipe for homemade puffed quinoa. Puffed quinoa is high in fiber, protein and iron. I’m so happy I found something healthy for breakfast that’s tasty, gluten free and filled with nutrients. Dice and thaw the frozen mango, remove excess water/juice. Pour the quinoa puffs into the bowl, add the rest of the ingredients and mix. Add milk to taste and get eating – quinoa puffs get depuffed pretty quickly after adding milk! Cut the amount of seeds, nuts & berries in half if you want less calories. Freezing Mangos TIP: You can freeze mango in large pieces (about 4 per mango) and cut them while they’re still frozen. For some reason (sugar content?) the mangos don’t seem to freeze all the way and remain soft enough to be cut my a steak knife direct out of the freezer. Very convenient! Salt TIP: I like Guerande salts the best and the less expensive grey kind will do just fine for day-to-day use. I like the shaker with the coarse grey salt in it. It comes out in little crystals and is just delicious! So the tip is don’t settle for regular salt. I tried lots of kinds of salts (pink himalayan salt, red sea salt, dead sea salt, organic salt, regular salt) and finally fell in love with the Guerande. The earthy taste and simple joy in triggering memories of our trip to Brittany (Bretagne) is completely worth the little bit extra it costs. Don’t have a thermometer for food? You are DEFINITELY missing out – here are a few reasons why you should get a food thermometer. Why buy a food thermometer? Jamming! Making jam is so much fun and it’s even more fun with the help of a thermometer. While I love surprises, jam isn’t exactly supposed to be a runny mess or hard as a brick. Temperature does matter with jam and even though I can “see” when a jam is finished, the thermometer has proven me wrong on more than one occasion. Farenheight or Celcius? Doesn’t matter, just flip the switch. I like to make not only jams, but syrups, confits, dulche de leche and more – the recipes aren’t always from American sites. With the one little click, my thermometer has gone metric. Be sure yours has the same feature before you buy. Check your oven temperature! We couldn’t figure out why nothing was cooking until we bought an oven safe thermometer – BINGO! Our oven was lying to us! So instead of getting a new oven, we keep the oven safe thermometer in the oven and rely on it for an accurate temperature reading. An accurate temperature is a must for baked goods. Tricky to cook meat. Since we don’t buy factory farmed meat, our chickens don’t come symmetrical and our turkeys don’t come with a pop out timer. After drying out many a bird trying to cut into it and see if it’s done, I now use a thermometer. I also use it when I think my husband is undercooking meat:) There is no arguing with the thermometer! Check out this convenient chart for done temperatures or indicators. So now that you’re going to get a food thermometer, which one should you get? There is a really great guide to food thermometers that can help. We have two in our house, a digital instant read and a dial oven safe. You can probably find one that fits all of your needs, we only have two because our oven’s temperature gage does not match the actual temperature. Thermometer TIP: You can also check the temperature of your refrigerator. We found out that our 20 year old beast of a fridge actually does not get as cold as it’s supposed to. This is why our well planned and seemingly well executed attempts to work with pastry dough failed! While it’s cold enough for most stuff, delicate and sensitive items can easily ruin. Healthy cauliflower recipe here we come! If there’s one thing I’m good at, it’s short cuts. This quicker than you can blink recipe is a wonderful way to enjoy cauliflower without any messy or time consuming prep. It’s so simple! Put the head of cauliflower on a large aluminum foil and douse it generously with olive oil. Slice a lemon thin and cover 2/3 of the cauliflower that is exposed. Toss in thyme here and there, sticking it to areas that are not covered by the cauliflower. Wrap up and seal completely, the bake in the oven at 360 F (180 C). Bake until it feels soft to the touch, this can vary from 20 minutes to 45 minutes depending on the size of the cauliflower. The good news is that even if you overcook it, you can turn it into mash and it will be delicious! 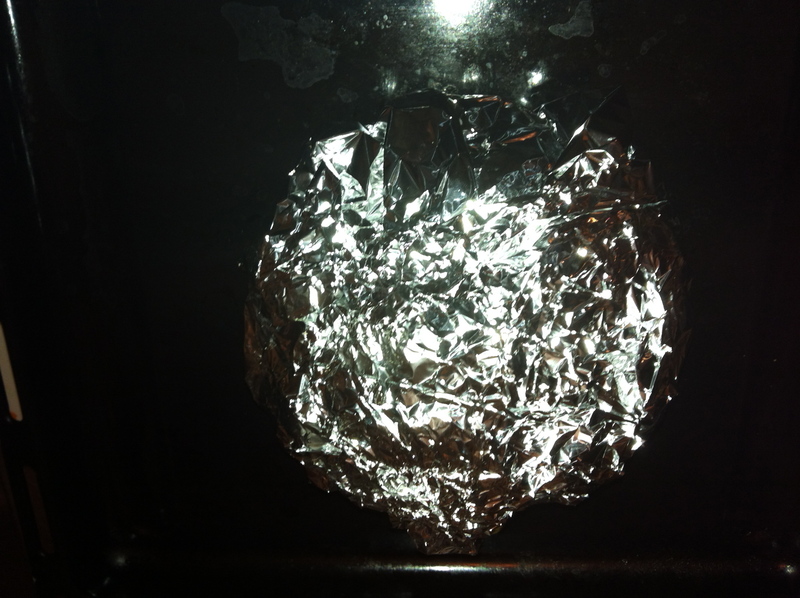 Because of the foil, oil & lemons, it’s very hard to burn this one. So this summer I got all into making popsicles. Coconut milk & berries. Peach with Greek yogurt. Even plain old water & cucumber “spa” pops. And in a love of creative spirit, I decided to experiment and make a minty pop. It seems attractive, the idea sounds good, but frankly, this was disgusting! The mint leaf was stringy and ruined the texture of the pop. The mint leaf, when consumed in giant chunks, tasted bitter. The mint flavor did not disperse, it stayed in the giant leaf. It was hard to eat the mint leaf because parts stayed frozen to the pop. I’m not giving up on minty pops, I will definitely try again – just not any time soon! 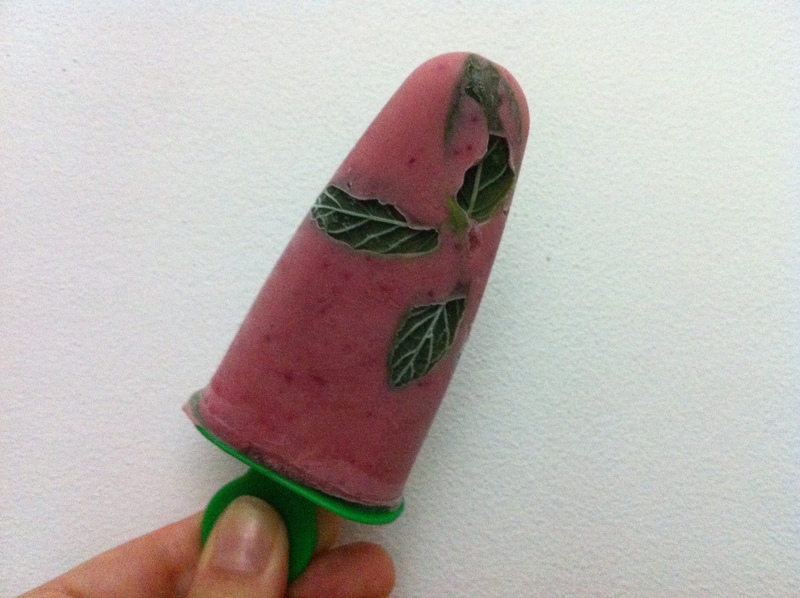 And don’t be discouraged from doing DIY mint flavors, just take into consideration that plopping a giant bitter leaf into a popsicle isn’t the way to do it. Happy pop making! Welcome to my perfect breakfast! When I started my weight loss and healthy eating journey, this was my rock. This breakfast was the solid start to my day that helped me kick start my new healthier life. My perfect breakfast has treated me well during these past 9 months, during which I have gone from clinically overweight to normal weight. I have never been so happy to be normal! Dice your apple – if it is organic, keep the skin. If it’s conventionally grown, peel it first. Place your diced apple in a bowl and cover it with yogurt. Sprinkle the flax and chia seeds. Top with walnuts. I like to mix the ingredients together into one big porridge, but I have a weakness for porridgey food. TIPS on Yogurt Breakfasts: Adding berries is always a good idea. One or two will do the trick and you can even use them direct from the freezer. Swapping out the apple for more seasonal fruits is a great idea, just keep in mind that the glycemic index and sugar content of fruits vary. And if you go for berries and no “fruit” it might be a little tart. Last weekend my husband and I went to an adorable cabin for the weekend. Check in was at 3, so we took our time. 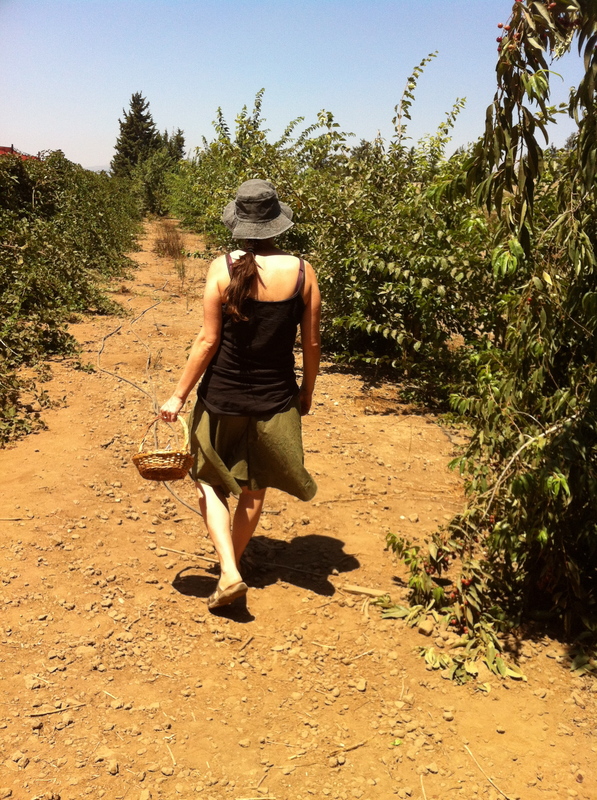 Luckily, we happened upon an amazing pick your own berries farm! Berries aren’t fresh and local for long, so we indulged and then did what any good homesteader wanna be does – freeze them. Because I went on a Low Sugar Strawberry-Rhubarb Jam making festival when we were swimming in strawberries, we’re now swimming in freezer jam. Take more than you need, then freeze it or make jam. If buying local and eating seasonally is important to you, then canning & freezing are your two best friends. 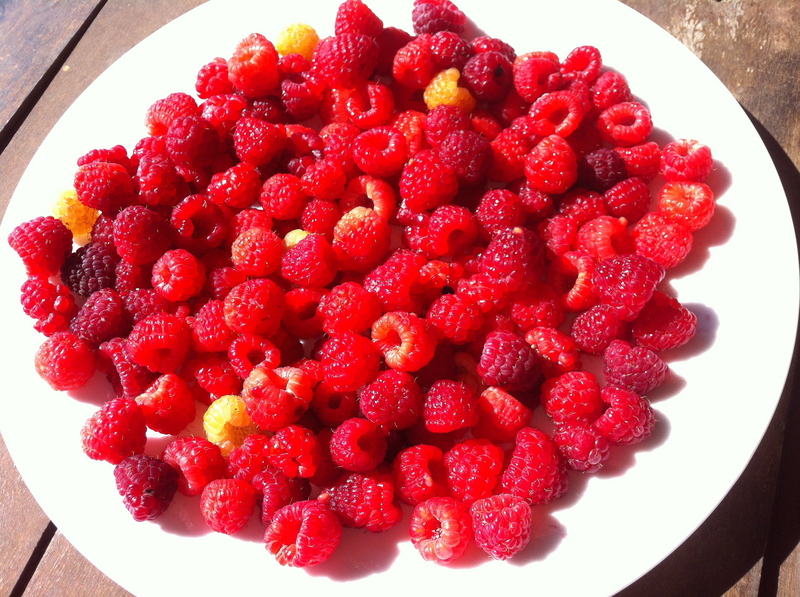 Use the darkest for eating now and adding to jam, use the lighter more firm berries for freezing. When freezing berries, they come out the best if you don’t wash them. You say dirt & bugs, I say minerals & protein. If you do wash them, dry them thoroughly and then freeze them on parchment, not touching. Be stingy – adding just a few berries to a smoothie is more than enough. My husband dumped a handful in and not only did it pilfer our berry supply, it made the smoothies filled with tiny berry seeds. Save them for special occasions – using a single berry on a dessert is elegant, using a pile of them can sour even the sweetest dessert. Going gluten free has been a challenge and one of the biggest problems is finding a good breakfast. Oats are great, but since many of them are processed with gluten containing products they can make me itchy. So I turned to millet. Millet is a really healthy grain, gluten free and super easy to cook. Its nutritional profile makes it a great after gym snack. Cook your millet. I use a rice cooker with 1 part millet, 2.5 parts water. You can do the same in a pot. If you are cooking millet in a pot, I recommend toasting it in butter first – it adds a rich flavor. When the millet is done and a little moist from butter or oil, add the dried fruit of your choice – I recommend unsulfured dried apricots. Top it off with nuts, in this case I used pecans. Millet for breakfast? Heck yeah – look at that nom nom nom! TIP on Ancient Grains: When cooking ancient grains like quinoa, amaranth and millet, I like to add berries while cooking. It cuts the earthy taste and adds a bit of sourness. Not everyone will like, but I do. It also adds a cute pink tinge to the cereal. If there is one food people complain isn’t tasty, it’s broccoli. Here is one way I’ve made broccoli drool-worthy – Old Bay. Steam your broccoli. Grate cheese over the still hot broccoli. I like Manchego cheese, but will buy what’s on sale. Use whatever cheese you want as long as it is fresh and freshly grated! Once the cheese is on, gently sprinkle on the magic Old Bay. Enjoy! The better your cheese, the better it will taste. Don’t even try this with sliced or pre shred. Notes: You can use frozen broccoli, but heat it slowly so you don’t cook it too much. There’s nothing I enjoy more than learning how to make my own something, and then triumphantly claiming “I’ll never buy that again!” Once you make your own jam or preserves you will never spend another penny on store bought. Not only that, you can buy local and eat seasonally without eating only what’s in season. These strawberries are in pretty bad condition – we bought them at closing time from a farmer’s market for almost nothing. Warning: This recipe uses 1/2 the sugar of most recipes and might not set depending on the ripeness of the strawberries. If it doesn’t set, no problem, the thickness of the rhubarb still makes it thick enough to spread. I do not believe in using sugar substitutes! 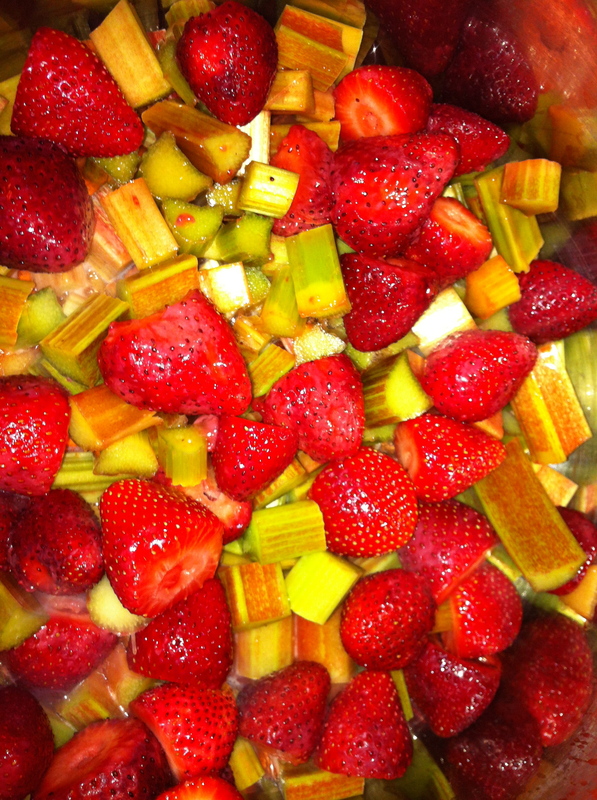 Keeping the rhubarb smaller helps equalize the cooking time of the quick cooking strawberry versus the slow going rhubarb. 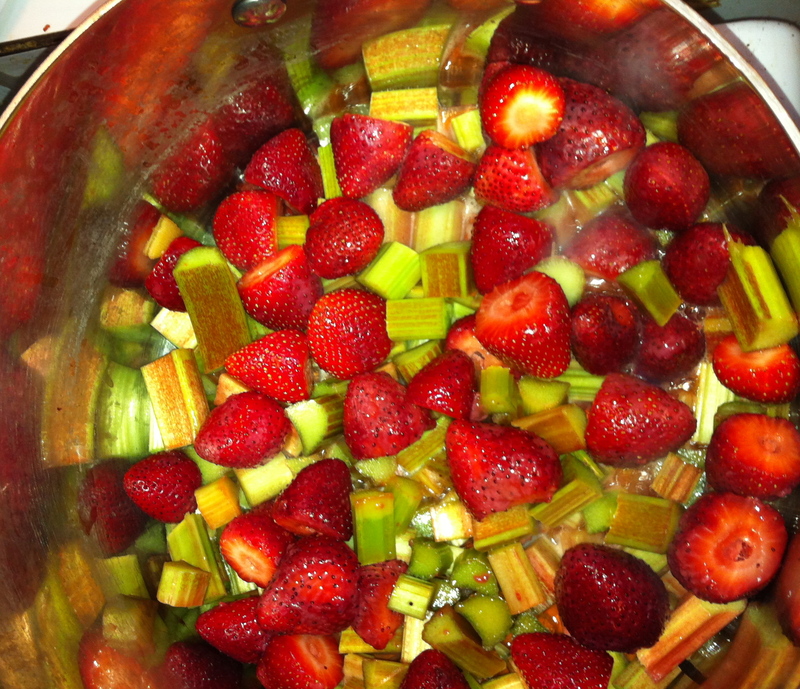 Start cooking your rhubarb over medium heat in the same pot you will use to make the jam until it softens just a little. Add the strawberries, pectin, lemon juice and butter then stir. Keep on medium heat and stir until the sugar dissolves. Switch to a low heat boil. Stir occasionally and skim off any foam. 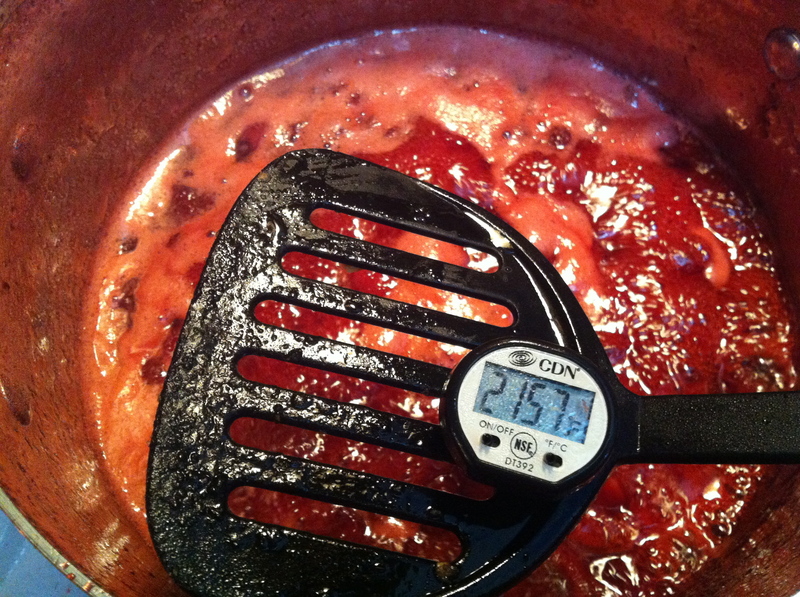 Using a thermometer (every home canner needs one) check your jam and turn off the heat when it reaches 222 degrees Fahrenheit (or 105 Celcius). Using pre-sterilized jars, pour the jam into the jars. Close the jars and turn upside down to cool. Tips on Jam Making: Copper pots rule! I know they’re expensive, but investing in one copper pot can give you great cooking results. When I switched from regular pots to copper pots, I noticed a marked decrease in unintentional burned food. Maybe it’s my imagination, but it seems like jam making is easier in the copper pot because the heat is more steady. Tips on Jars: Use a funnel to pour into jars. If you’re reusing jars, check and make sure there are absolutely no signs of wear and tear in the lids whatsoever. In fact, I recommend purchasing new lids often – you can get them separate from the jars. Tips on Pasteurization: This jam is NOT pasteurized – it must be used in about a month or two if refrigerated and should be frozen if you don’t think you will use it. If you want to pasteurize it, do it. Maybe when I’m a mommy I’ll pasteurize, but for right now I’m happy not pasteurizing. Tips on What to do with Jam: If you’re like me, you have a glut of jam. Aside from giving it away, here is one cute thing we did with ours. 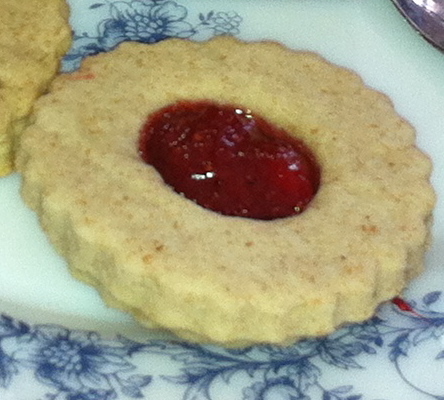 We made Spelt Strawberry Rhubarb Jam Cookies. Notes: While not necessarily inspired by this recipe, I did get the idea of adding butter in jam from this All Recipes Strawberry Rhubarb Jam. I was happy with the results.